What if The Texas Chain Saw Massacre was from Leatherface’s point of view? And what if he and his family weren’t murderous cannibals, but were just terribly, terribly unlucky? That’s the premise of the horror-comedy Tucker & Dale Vs. Evil, co-written by director Eli Craig and producer Morgan Jurgenson, and starring Alan Tudyk and Tyler Labine as two good-hearted rednecks who accidentally torment a group of dumb, boozed-up college kids out camping in the woods. Tudyk and Labine are up in their “vacation home”—a rickety cabin once owned by a psycho killer—when they inadvertently frighten a skinny-dipper, who bumps her head and nearly drowns. They take the girl (Katrina Bowden) back to the cabin, and try to contact her friends. But Tudyk and Labine’s friendly overtures keep getting misinterpreted by the douche-y undergrads, who end up killing themselves while trying to go after the hicks. Tucker & Dale Vs. Evil is too slick and too cute; Tudyk and Labine are terrific comic actors, but the movie might’ve been better served by less-recognizable faces. As it is, the stars look like funny guys in hillbilly costumes, while their adversaries—with their turned-up collars and feathered hair—look like they’re play-acting as well. Also, Craig and Jurgenson deal out most of their best cards in the first half-hour of the movie, then repeat the “judging a book by its cover” farce and slapstick violence for another hour. 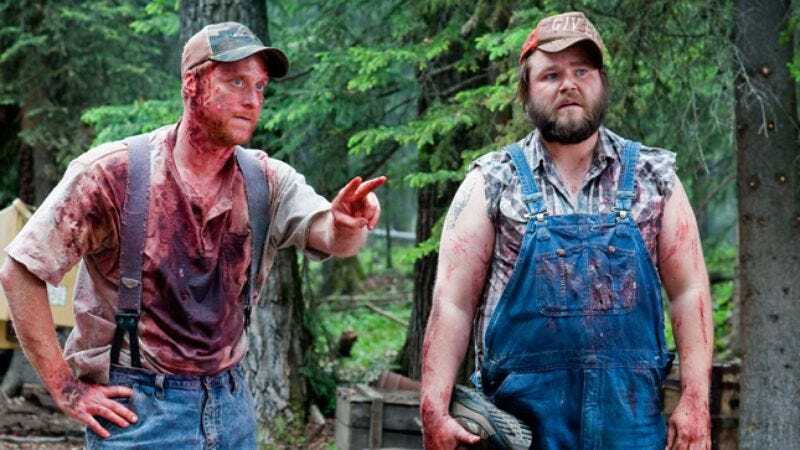 But for a broad comedy, Tucker And Dale is surprisingly clever with its kill-scenes, which are set up as well as the ones in any slasher flick. The filmmakers have thought through how deadly misunderstandings can happen, like when the co-eds approach the cabin right as a chainsaw-wielding Tudyk is attacked by bees, or when a kid jumps at Tudyk and lands in a wood-chipper. The jokes in Tucker & Dale are funny—just not funny enough to hear over and over.